A new book is coming! 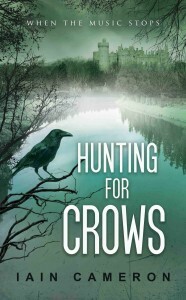 Yes, the 4th book to feature DI Angus Henderson, called Hunting for Crows, will be published 18th March 2016.When the DI hears of the drowning in Arundel of Barry Crow, former bass player in the 80s rock band, the Crazy Crows, he is intrigued. When the drummer dies, choked by a barbell in his home gym, he starts to investigate. Things don’t go as planned and in his search for the truth, Henderson comes face-to-face with not one, but two deadly opponents, both of whom want him dead. Available from Amazon 18/03/16 – £1.99 for the Kindle edition. From the sedate world of the literary festival, there’s talk of a storm brewing. Authors for many years have been complaining about receiving nothing, or a minimum amount to cover expenses, for speaking at various literary festivals. In addition to the low fee, some festivals also insist that any speaker signs a contract, forbidding them from speaking anywhere else for a specific time period. Some authors, such as Joanne Harris, author of Chocolat, are now saying enough is enough and they will boycott this year’s festivals. Many small festivals are charities, staffed by volunteers and parsimony goes with the territory, but others are large commercial enterprises with sponsorship from local businesses, and in my opinion, they should pay their speakers a fair and reasonable appearance fee. I recently posted an article on my blog called Does Hollywood Love Authors? It’s surprising to learn that due to Hollywood’s in-built conservatism and aversion to losing money, many of the ‘big’ movies it produces are remakes of old ideas or extensions of existing ones. For proof, think Star Wars or the new version of Mary Poppins currently being planned with Emily Blunt. When directors adapt a screenplay from a book, the film is often more rounded, intelligent and better plotted than a hastily constructed screenplay, and providing it keeps faith with the original, the producers can tap into a ready-made audience. Heard of it? This new program offers those who sign up to the free newsletter, four e-books a month before their official print publication. You can then purchase one of these Amazon-branded titles for £0.99; Prime members can choose one for free. Amazon Publishing publicist Katie Finch said: ‘Each Kindle First pick will feature an Editor’s Note sharing why it was selected, including how the book first came to the editor’s attention.’ To find out more, click the ‘Kindle First’ tab on the Amazon home page. Publisher’s Penguin are offering 100 out-of-copyright classics to schools for £1 each. They are being sold as a job lot of 100 books and will include Bronte, Dickens and some Chinese and Arabic books as well. The Publishing Director of Penguin Classics said: ‘It’s about the incredible importance of having books lying around, and getting away from the curriculum.’ Scholastic started a similar scheme a few months ago with 26 books. It’s worth mentioning this to your child’s teacher in case they haven’t heard, and if you would like to read one yourself, many can be downloaded free as an ebook from various websites such as www.gutenberg.org. That’s all for now. Keep reading!